You may draw up several versions of ad materials for each of the offers you intend to publish via Yandex.Direct and the most clickable of these will be displayed to the site visitors automatically. This will help you understand which of your ad materials are better at attracting your target audience and thus ensure that your placement gets you better results. Advertisement professionals call such experiments A/B or split testing. A/B testing is one of the simplest and most popular methods used in marketing research. According to this method, all other things being equal, users are shown several versions of an ad or site element, e.g., of a title or ad text. Statistics show which of the versions is preferable to the target users. First, categorize your keywords by types of your products/services. For example, if you sell bicycles, you can categorize your keywords in the following way: mountain bikes, city bikes, kids’ bikes and bmх. Then prepare several ad texts that you would like to test for each group of keywords. You may test a wide range of variants, e.g., talk about a discount, highlighting that this is a limited-time offer. Or specify the models you wish to include in the offer. Try experimenting with images as well as texts. 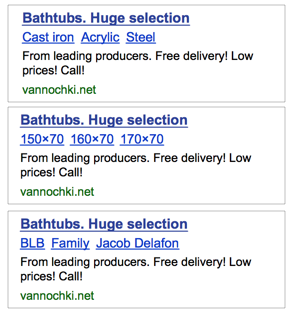 Thus, Yandex.Direct gives you a chance to A/B test almost any element of your ad. Please note that every ad version in the group must match the keywords. We advise you to test versions for only one ad element at once, e.g., test only different texts or different images. If all the ad elements are different, this will make it difficult to assess each element's contribution to the overall performance. At the first stage , all the ads in the group will be displayed in the rotation. As soon as enough statistics is accumulated, the system will automatically identify and display the most clickable ad for each keyword more often. You can disable or edit ads that are less effective at any time. Here is an example of a change in the CTR and ad impression share for two ads in a group that were served in premium placement positions over a calendar month. 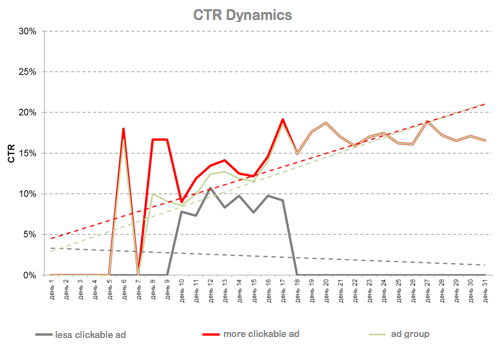 The diagrams show that the more clickable ad is gradually displayed more often, contributing to the growth of the total group CTR. This example illustrates the principle by which an ad group functions. However, the experiment may develop in other ways as well. Every case is special and the results of each testing are affected by a number of factors. Note. Many factors (user behavior, the season, hour of the day, etc.) are taken into account to identify an ad with the best CTR. 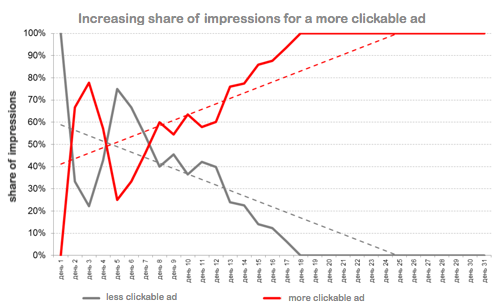 That is why the number of impressions of each ad in a group varies.